'War, what is it good for?' 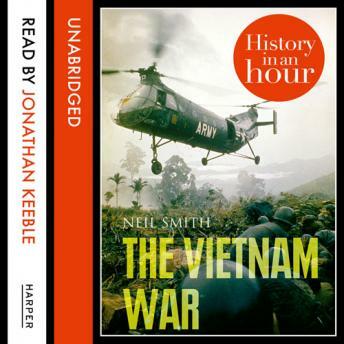 THE VIETNAM WAR: HISTORY IN AN HOUR gives a gripping account of the most important Cold War-era conflict, fought between the United States and the Viet Cong, the Vietnam People's Army and their Communist allies. It was one of the most traumatic military conflicts America has ever been involved in - and provoked a backlash of anti-war protests at home. Here are the key events leading up to the Vietnam War, the deadly guerrilla warfare of the Viet Cong, the domestic anti-war movement and the fall of Saigon. THE VIETNAM WAR: HISTORY IN AN HOUR is essential reading for anyone interested in post-war history.